For years, SMS or text messaging has been one of the most convenient ways to communicate. In fact, texting is the most frequently used form of communication for Americans under the age of 50. These days, we don’t just use SMS to stay in touch with friends and family. Businesses are also taking advantage of SMS and text messaging to promote their brands and stay in touch with customers and clients. SMS marketing is changing the way we connect and engage with customers and clients. SMS marketing is a “permission-based” activity that allows you to send marketing messages or updates to customers and clients who choose to opt in, similar to email marketing. SMS marketing is fast, effective, and inexpensive, which means it’s a great option for both small and large businesses. With a predicted 48.7 million customers opting in to business SMS in 2020, this growing marketing tactic can be a great way to promote your coaching business. Here are five SMS marketing best practices you can try out. If you’re hosting an event or giving a keynote, you know how important it is to get interested individuals signed up for your email list or subscribed to your newsletter as soon as possible. Unfortunately, when you’re on stage isn’t the most convenient time for listeners to pull out their laptops and fill out your homepage form. An SMS opt-in is an easy way to get your audience signed up before they become distracted or forget about your brand. With an SMS opt-in, users can text a specific word or phrase to a unique code. This automatically signs the participating individuals up for your messages, allowing you to easily connect after the event. Sending emails is a common way to remind participants that your webinar or seminar is starting soon. However, when customers and clients are getting dozens of emails every day, the message may get lost in their inbox. This leaves you with lower attendance, and customers and clients feeling frustrated about missing out. With 98% of text messages read within two minutes, using SMS to alert your audience of upcoming events is a great way to improve your attendance. Simply send out a short and sweet message before the event begins and users never have to worry about forgetting again. Failed payments can be irritating for both you and your customers. When a credit card expires or a transaction wasn’t approved, it’s important that you alert your customer of the issue as quickly as possible so the situation can be sorted out. Unfortunately, an email can get lost in the customer’s inbox and not get opened for hours or even days. Using SMS instead allows you to connect with your customer right away, let them know there was a problem, and get the mishap handled as soon as possible. SMS is also a great way to connect with a large audience at once. Similar to email blasts, SMS allows you to send the same message to a number of individuals easily and cost-effectively. This can come in handy when you’re hosting large events and conferences. Through SMS, you can alert attendees of breaks, lunch periods, event starting times, and more. By using SMS as a broadcasting tool you can give your attendees the convenience and ease of an event app without needing to put in the time and money to develop such a high-tech system. When a new recipient signs up for your email list, one of the first things you probably do is send a welcome campaign. That is a great way to increase loyalty with your new lead and ease them into your new communication. You can do the same with SMS marketing. By creating an SMS campaign within your automation tool, like ActiveCampaign, Ontraport, or Infusionsoft, you can send a chain of messages to your recipients that helps to build your relationship. 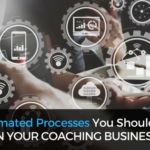 Whether you have an upcoming event or you’d just like to implement SMS marketing campaigns into your daily coaching activities, Automation Agency can help you schedule & automate your messages. SMS messages can be hosted and automated through software you’re probably already using. From Ontraport to ActiveCampaign, SMS messages can be easily added to your current automated marketing and sales funnels.